Manx cat breeds were originally from the Isle of Man, off the coast of Great Britain, in the Irish Sea. The distinctive feature about this cat is that it does not have a tail, making it a unique breed of cat. These cats have round qualities, as they tend to have round faces, round bodies, round eyes, and can sometimes even be round pawed. The maturing of this cat takes place only very slowly, and they come in many patterns and colors. 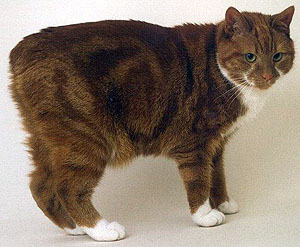 A Manx cat has a thick coat which is actually a double coating, and thus it looks padded. The hair is very soft on the bottom coat, while the top coat is glossy. Their coat has to be brushed two or more times a week so that is stays shiny and glossy. The Manx has a solid compact body structure and is short backed with short and powerful legs to complement their rounded shape. Large headed and round, their nose is short and the widely spaced ears are set slightly outwards. They can weigh around eight to twelve pounds. Rumpies – have no tails but just a dimple at the base of their spines. 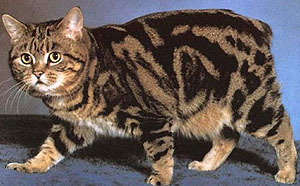 These are the show cats of the Manx cat breeds. Manx cats have a long lifespan as they can live up to fifteen years of age. The age factor in this breed of cat is known to be extended to twenty years with the best care and nutrition. Manx cats don’t enjoy being left alone and prefer the company and attention of their owners. They get along well with other cats and children for this reason. Our dear friend of more than 18 years just passed away two weeks ago. He was almost identical to the second cat pictured here. He was a fine fellow – a tuxedo Manx. He was one of my best friends. He was smart, loyal (he stayed with my wife constantly when she was ill) He was a fierce hunter – squirrils, birds and chipmunks were almost weekly presents until “the bell collar”. I miss him and the magic he brought into my life. To anyone considering a Manx — as any other Manx owner will tell you – they are just THE BEST. So sorry to hear about your loss. Just remember the “Rainbow Bridge” poem. My wife and I were caretakers for a beautiful Manx cat named Liam for several years. We adopted Liam from a shelter and he was the kindest, most affectionate cat you could imagine. He was gray and white with just a stub of a tail. The old Gaellic word for a Manx cat is “Stubbin.” Funny how that works, isn’t it? We lost Liam today, to kidney failure, and we will never forget the years we spent together. Here’s to all cats everywhere and the unconditional love they show. July 4, 2010 Our manx passed away. He was twenty-two years old and his name was blonde. He was the greatest . He was lovinging and caring. I did not want to let him go, but he stopped eating and drinking. I miss him alot. I have a female , she has no tail at all and round everything- her name is Bobbett because the woman I got her from at 8 weeks old was calling her bob and I told her that I bet its a female so it was BOBBett- she is so sweet and loving with me and dont want anyone else to touch her my mother and daughter are afraid of her and every one says she is mean but she is not. she sleeps with me laying across my are like a new baby I love her so much. I had my little girl for six years, she was a stray and I took her home with me. she died feb 9th 2011 of kidney failure and high thyroid. I hurt so bad and I blame myself. mabe I could of done more for her. I will find two girl kittens this spring or summer or they will find me. I have so much love to give and share and I would love to give it to two this time who may need a good home with a mom like me because Callie was spoiled rotten and well taken care of. but the pain is so bad, everywhere I look in my home belonged to her. I love animals a lot but cats are the best. I have a manx cat – a 7 years black male called Cox. He is very inteligent, comunicates with us a lot and is very loving. His favourite spot is on my chest with 1 paw along my face. The best cat ever. I hope to have him with us for the longest time possible! I have a 13 year old Manx her name is Amber, Manx’s usually have short fur, but Amber has the longest thickest coat you ever saw. She’s multicolored, kind of a tortie/tabby, but the long fur makes her just incredibly beautiful. This site says they don’t like to be left alone, but she doesn’t seem to mind it. She is quite vocal and very smart, she’s always able to tell me exactly what she wants and needs. She’s strictly a house cat, but I carry her for walks at night, and she loves it. Manx is a great breed of cat, don’t hesitate to get one, and Idk, I think cats look better without a tail. I had the most beautiful Manx cat in the world, his name was Sox and he was the most affectionate and loving cat I could have ever wished for. He came from a bad background then we took him in to care for him. We had him for about eleven years until we learned that a woman in our street used to feed him with chicken necks, then when she tired of all the cats in the street bothering her, she thought it was best to trap them or put out poisonous substances near the food he was giving them. She told us she thought they were all ferrel cats. (Ummm hello, why would ferrel cats have collars??) Unfortunately Sox was exposed to some unknown material which poisoned him and he was put to sleep on Christmas eve 2010. Don’t hesitate when choosing the cat for you, Manx Cats are a beautiful breed and very loving indeed.
. He doesn’t like to be messed with. We had a Manx cat “Thomas” for 15 years. He was the best pet anyone could ask for! He was so loving. Acted more like a dog then a cat, he would greet everyone who came in the door. He was a very large manx cat with a stubbie tail, we found him as a baby close to a busy highway. He was a blessing to our family! It’s been over 4 years now and I’m now trying to find another kitty to love. I have adoption papers in on a siamese/manx kitten that is in foster care after being rescued. Hope we get him!! Our White with Black Tuxedo Manx is now 10 years old. She adopted my wife as her human. But loves to play with anyone her has the time for her. But for my wife, she is the only person who gets lap visits from her. She was named Pebbles. Thats Fruity Pebbles when she’s being fun and silly and Cocoa Pebbles when she being mischevious and devilish. She was the first born of her litter and the only with a full tail, well I say full, but it is still short for a cat, the tail is about 9 inches long and her body has the distinctive shortness to it as well. He hind legs are proportionally larger and as a kitten caused her to run sideways until she learned how to control the manx rear end power train she was born with. She never over eats. and had maintained her very slim weight her whole life, even when piggy cats eat all the food, she only eats a few bites at a time and eats when she needs too. Which means if the other cats ate att the food by 3:00am, then around 4am we get a wake up call where she knocks things over of rips paper in the bedroom knowing that she eventually will wake us, get eyye contact then run to the closet where the food resides. And if we don’t get up, she will relentlessly do this until there is food in the bowl and then eat 3 or 4 bites and go back to sleep. Pebbles loves to be brushed. Though as a short hair, she doesn’t lose much hair during a brushing, but her coat gets a good shine too it and grooming your cat always is a part of joining his or her pack. I have a female tortoiseshell named sweet-pea. She will be 19 in April 2015. Still looks great and has all characteristics mentioned previously by all. I will never get another kind of cat and may not be able to get another one at all. I am marveled by her intelligence, physical capabilities and affection and dedication to me. She caught a wild weasel and brought it home for me one night. If you have a Manx and put a cat/dog door in be prepared!!!! Just got my Manx from a shelter in North Carolina . I love him already,he is so sweet and loving follows me everywhere I go. Sleeps at the foot of my bed. He wants to go outside but I am afraid to let him, we have coyote’s around and I don’t want anything to happen to him….